Curity™ Unna Boot Bandage is formulated with non-hardening zinc oxide paste which allows the bandage to remain flexible. They are gelatin free which eliminates the need for preservatives, which in turn reduces the chance of adverse skin reactions. 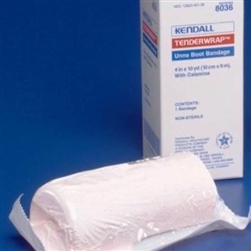 Curity Tenderwrap Unna Boot Bandages are soft, non-raveling 100% cotton gauze that conforms well to leg contours for a comfortable fit. They are impregnated equally throughout the entire bandage to help deliver firm, even compression therapy for a multitude of bandaging needs. Curity Unna Boot Bandages are excellent for use on venous stasis ulcers (especially with moist desquamation), lymphatic edema, thrombophlebitis, and strains, sprains, and dislocations.